Welcome to J. 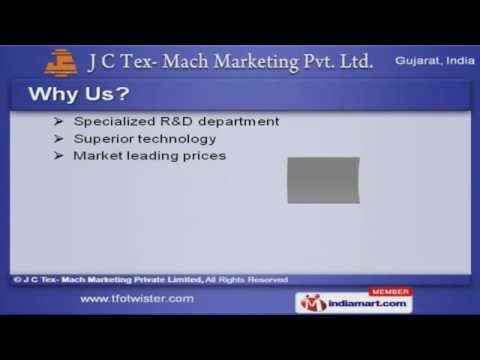 C Tex- Mach Marketing Pvt. Ltd. Manufacturer & Exporter of TFO Machines.The company was Established in 2006, at Surat. Strict adherence to quality, Extensive network & Rigorous quality inspection help us to stay ahead of our competitors. Superior technology, Market leading prices & Industrious workforce make us unique in the industry. We offer a diverse range of TFO Twisters, Lycra Coverings & Silk Yarn Machines. Our TFO Twisters are well known for their durability and reliability. We also provide Silk Yarn Machines that are best in the industry amongst others. Along with that we offer 2/3 Ply Twisters that are widely acclaimed in the market. Our Cops, Cheese & Yarn Splitting Winders are a class apart. Elastic / Lycra Coverings offered by us are well known for their outstanding performance.